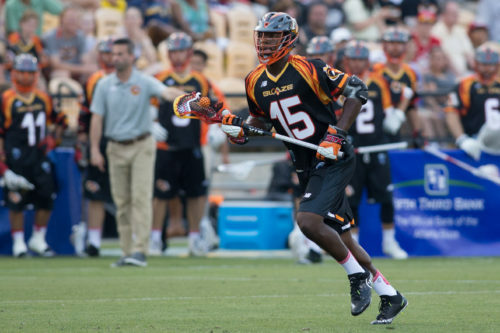 According to Inside Lacrosse, the Atlanta Blaze have sent Myles Jones to the Chesapeake Bayhawks for Matt Mackrides. Mackrides has played in the league for five seasons, all with Chesapeake. Matt was averaging about 20 points a season entering 2016. In his seven games this year, he has totaled fifteen points with eight goals and seven assists. He is one of the quickest players in the game today and will add exceptional speed to the Blaze midfield unit. Atlanta is sitting in seventh place at 2-4 but is fifth in goals for with 92 and has the second most two-point goals in the league at six. The Blaze are averaging 16.3 goals per game, giving them a .633 Shots On Goal percentage and the second highest shooting percentage (.341) in the MLL. Adding a Team USA midfielder to this high shooting percentage makes Atlanta even more dangerous offensively. Mackrides’ presence on offense down South will help draw defenses to him and take pressure off of the young talent they have there, opening up more opportunities for Kevin Rice, Randy Staats, Ryan Tucker and Deemer Class. Jones is coming off a stellar career at Duke and has seen action in two games since joining Atlanta, tallying three points (2G, 1A). His size and athletic ability will be welcomed with open arms in Chesapeake. The Bayhawks are 4-3, putting them in third place thanks to their tie breaker win over Charlotte. Chesapeake has the lowest shots on goal percentage in the MLL right now at .593, with a .277 shooting percentage overall. Jones’ ability to dodge and put a lot of shots on goal will help those percentages increase. He will fit into the Bayhawks’ offensive plan as they like to slow it down and work for quality shots. He joins a group of offensive talent that has been around the league and know how to win, including his former Duke coach, Matt Danowski, along with Drew Westervelt, Brendan Mundorf, and Joe Walters. The opportunity Myles has to learn from these guys will mold him to become a more complete player for the league. This move overall makes sense for both players. Sending a young & talented big guy to an offensive unit that has a lot of knowledge and power to help him learn the MLL game is great for Myles. Whereas Mackrides now has the opportunity to become that leader of the pack after playing with Danowski, Walters, Westervelt and Mundorf for years and get to take the young talent down in Atlanta under his wing and help mold them. The offensive units for both teams matches what these two guys can do best and it will be exciting to see these two young men in their new roles.